We're big fans of the Simpsons here at Lost States, having previously spent way too much time trying to crack the Simpson's 5-state mystery. 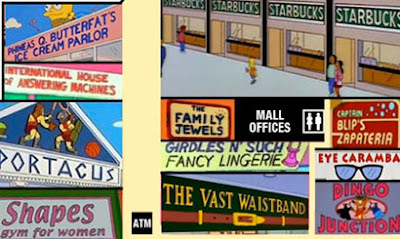 Today we offer thanks to the fine folks at "Pleated Jeans" who created the Simpson's mall map. Now we know exactly where to go to get our pants (Vast Waistband) or lunch (Kentucky Fried Panda). See the full map here.